A Nurse Specialist from Cardiff and Vale University Health Board has been announced the winner of the ‘Society for Endocrinology Endocrine Nurse Award 2018’. Janet Lewis, Lead Endocrine Nurse Specialist was recognised by the Society of Endocrinology which recognises individuals who have demonstrated innovative and successful nurse-led initiatives in the endocrine field that have advanced best practice in research, education or patient care. Janet was chosen for the award because of her leadership in devising recommendations that improve the healthcare provision and equality of care with patients diagnosed with Neuro-endocrine tumours (NETs). These patients diagnosed with this rare cancer throughout all of Wales did not have equal access to treatment and were subjected to a post code lottery. Janet and her patients campaigned extremely hard over many years to ensure that all NET patients in Wales had access to equitable care. 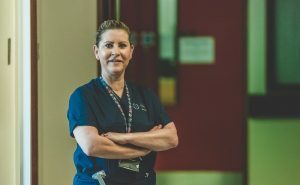 As a result of Janet’s hard work there is now a fully commissioned NET service in Wales, the first of its kind in Wales which is hosted by Cardiff and Vale University Health Board. All NET patients in Wales now have access to pioneering treatment in NET Centre’s of Excellence in London and Liverpool. If you have a nurse colleague that you would like to nominate for the 2019 Endocrine Nurse Award visit www.endocrinology.org Applications are now open until 29 June 2018.